There are two sides to our story with two different doors. A Fun Place to Shop for the Whole Family! We are committed to providing top notch customer service, the highest quality, and a warm friendly environment staffed with knowledgeable and well-trained employees. Caring for our customers, our employees and the environment are our top priorities! Our staff is committed to giving you courteous and knowledgeable customer service. While shopping for that perfect gift we will treat you like family at family prices. “The best experience! I was leery of going to a pawn shop because I've heard not very good things. 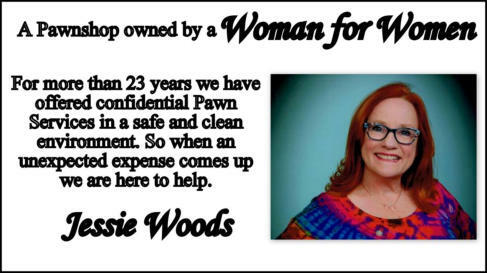 I checked the Yelp reviews and it sounded like the place was perfect for a woman who has never had to pawn anything. The owner came over and told me how it works and listened to my story. She made me feel so welcome! It was wonderful as she made me feel comfortable and her compassion and advice were just what I needed. There are two sides of the store and when I was done in the pawn side of the shop, she recommended that I go check out the other side on my way out. The lady on that side knew exactly what I needed and was just as compassionate and caring as the other side. They have a life long customer! Thank you ladies for making my day so wonderful!” - Tracy F.
Since 1994 we have chosen Red Bluff as the place to raise our families and run our business. We have been Red Bluff's premier hometown jeweler, reputable pawnbroker and more meeting the needs and desires of the community with a wide selection of high quality merchandise and dependable services. I can't say enough about the staff and merchandise at the Red Bluff Gold Exchange. The knowledge of all staff is vast, they are helpful, courteous, service oriented, and creative. Their merchandise is high quality and unique; you can find the perfect item for any occasion. The owner is dedicated to this small town and works with service organizations throughout the community - what a great role model! Everything about this business is AWESOME!!! This is my "go to" store for sure!! Thank you to everyone who is part of this business - you shine!- Lynette M.
I can't say enough about the staff and merchandise at the Red Bluff Gold Exchange. The knowledge of all staff is vast, they are helpful, courteous, service oriented, and creative. Their merchandise is high quality and unique; you can find the perfect item for any occasion. The owner is dedicated to this small town and works with service organizations throughout the community - what a great role model! Everything about this business is AWESOME!!! This is my "go to" store for sure!! Thank you to everyone who is part of this business - you shine!-Lynette M.